We get busy taking care of our local youth for prom, homecoming, winter formal, the father and daughter dance and more. Corsages-Boutonnieres orders are one of our many specialties. 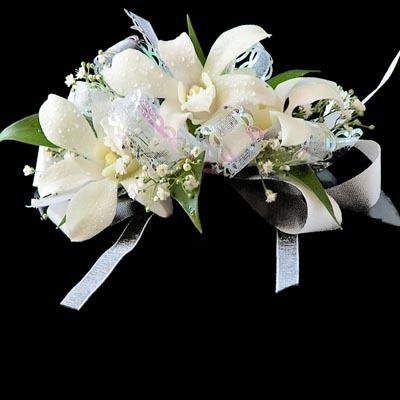 We also understand that Corsages and Boutonnieres need that personal touch to fit the event and bearer perfectly. Our Corsages-Boutonnieres are unique and made to order. Colors, sizes and bling are all taken into consideration on each order. We do not offer a one size fits all approach to your corsages and boutonnieres. We get your full input on flower colors, ribbon colors, add on bling, e.t.c. Our prices are the best in southern Oregon. We offer corsages from $14.99 and boutonnieres from $12.99. If you need something simple we are glad to help. If you need extravagant corsages and boutonnieres, we can help with that too. In Central Point Oregon we are located at 337 E Pine st. Our phone number is 541-664-1878. Most of our customers ordering corsages-boutonnieres, call or stop in to order as each order is designed to match the dress and or the tux and the situation. Also, while most for corsages-boutonnieres are picked up at our store, we do offer delivery with a delivery fee (most addresses are $9.99) to Medford, Central Point, Ashland, White City, Eagle Point, Jacksonville, Gold Hill, Phoenix and Talent. If you stop in to order it helps if you have a sample of the dress color. Many of our customers simply show us the color on their phone or with a piece of the fabric. We can use this to help get the perfect color flowers and ribbons for your corsages and boutonnieres. Come see us at Judy’s Central Point Florist for the best in flowers for your prom and formals here in the Medford Oregon area. We guarantee everything we do and have been making the occasion special here in Southern Oregon for more than 35 years. Fantastic posting, it is great to finally find insightful writing on the internet, I am greatly pleased to find a blog that is not full of the normal garbage, thank you. Hi it’s me Fiona, I am also visiting this site regularly, this website is truly pleasant and the people are really sharing nice thoughts. site loading pace is incredible. It seems that you’re doing any unique trick. Very handful of web sites that occur to be detailed below, from our point of view are undoubtedly effectively really worth checking out. north,” said Jeff Schwilk founder of the San Diego Minutemen. of one of their own,” Garza said. I just want to say I’m all new to blogs and seriously enjoyed you’re web page. Very likely I’m want to bookmark your blog post . You definitely come with exceptional articles and reviews. Regards for sharing your website. minutes and actual effort to produce a great article… but what can I say… I procrastinate a lot and never manage to get anything done. This article will assist the internet users for setting up new webpage or even a blog from starrt to end. I simply want to tell you that I’m beginner to weblog and definitely liked you’re page. Probably I’m going to bookmark your site . You certainly come with wonderful writings. Appreciate it for sharing your webpage. I simply want to tell you that I’m new to blogging and site-building and certainly liked your blog site. Very likely I’m want to bookmark your blog . You actually have amazing stories. Appreciate it for revealing your web page. Good – I should certainly pronounce, impressed with your site. I had no trouble navigating through all the tabs as well as related information ended up being truly easy to do to access. I recently found what I hoped for before you know it at all. Quite unusual. Is likely to appreciate it for those who add forums or anything, site theme . a tones way for your client to communicate. Nice task..